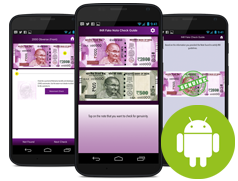 "INR Fake Note Check Guide" - A mobile app that checks the genuinity of newly minted 2000 & 500 currencies. 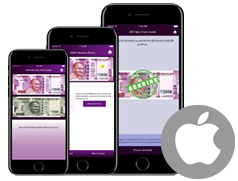 "INR Fake Note Check Guide" is a mobile application based on the RBI (Reserve Bank of India) directions that help an Indian currency user find out whether newly minted and circulated 2000 and 500 notes are genuine or fake. The app is compatible with a large number of iPhone as well as Android phones and is available now in App Store and Google Play. As per the RBI instructions, the newly minted Rs. 500 note is completely different from the old note while the new Rs. 2000 note has 17 distinctive features to make it stand out. The "INR Fake Note Check Guide" does not automatically tell you whether your 500 or 2000 rupee note is a counterfeit or not; Instead, it takes you through the RBI security features provided in the notes one by one thereby allowing you to verify every security feature yourself. Individuals who want to quickly skim through the RBI directions on their smart-phone to find out whether the notes in their hand are genuine or not. Organizations, businesses or shop owners who want to quickly check a suspect note that they received as part of a transaction through the store. Cashiers to quickly identify a counterfeit note. They can either use the app to quickly check whether a note is counterfeit or use the app as a quick reference for the RBI security feature checks. Bank employees to get trained on the RBI security features available in the notes. Disclaimer: This app is not a replacement for the actual verification and checks done by banks or other similar authorized organizations, who remain the sole authority for the authorization of authentic notes.